This is a simple and cheap homemade laser driver. which makes it possible to use it for >1000mW laser diodes. The 1.25V is the Reference Voltage of the LM317. The Variable Resistor can be used to control the current to the diode. Insert the momentary Resistance of the potentiometer here. 53 Responses to "Homemade Laser Driver with LM317"
Is there any video which shows this design? No, I only took photos. Not anymore, I understand it now. But I do have another question, my Laser diode is 300mW if I calculated it right, I need 9 ohm, but is it a problem if I do 10 ohm? Your diode will work at 95% power. That’s great, it’s more safe in case of any issues. Always try to use current below recommended if you cannot match the exact calculation. Laser diodes die very quickly if you exceed the maximum power. Would this driver work for a 2w laser? The data sheet states a max of 1.8A, the resistor values I punched numbers for was for 1.7A. I thought the LM317T supplied an excess of 1.5A? Page 6 Table 4: The maximum output current I_O(max) ranges from 1.5A min. to 2.2A typical, depending on the batch your LM317 is from. The 1.5A is the guaranteed value for I_O(max). If you are lucky, it can supply 2.2A or maybe even a little more. You should also consult Figure 3 on Page 9 of the datasheet for your use case. Junction temperature and the input to output voltage difference also effect the maximum current you can draw. With a large heatsink and a fan it is possible to push the LM317 a bit more than you should, but I don’t know how long it would last. Ahhhh misread on my part, thank you for the insight my friend! Thanks for all your explanation, it was extremely helpful! I have the circuit and it works well, I am always monitoring my current and use the minimum allowable current to drive my laser so I am pretty sure I am not over driving it, the circuit works fines for days but sometimes it burns my laser very slightly, in the sense that the light gets dimmer! I found out that if I don’t discharge my capacitor and chance the laser diode it would be burnt, do you have any similar experience? The capacitors (I assume you are refering to the capacitors right at the output) have to be discharged prior to connecting the laser diodes. When the circuit is powered, but not connected to a laser diode, the capacitors will be charged to approx. supply voltage. When the diode is connected then, the capacitor will immediatly discharge, hence damaging the laser diode through over-current. Adding a discharge resistor in parallel to the capacitor can help avoid this problem. 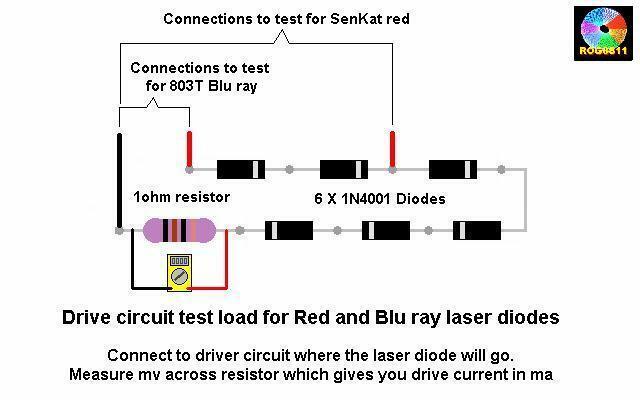 I did follow this, and test use led, voltage’s led are 8V… if use for LD can destroy LD? Using an LED to test the circuit won’t work. You can use this circuit to replace the LD for testing. Hi, can the circuit be powered with 12V? I want to power red 200mW module from ebay… It does not have other specs – just power and wavelength. If I understand the principle correctly, it’s the current going through the laser diode that matters, right? 12V is fine for this circuit. Yes, the diode current has to fit the diode. Try to find a data sheet for the used diode. The operating current of a 200mW (output) diode would be somewhere between 100-150mA. I’d suggest starting with 50mA though. Hello could you tell, me how can i do to increase it up to 4000mw ? With the LM317 IC its not possible. But there are other circuits for this purpose. There are many pre-assembled boards on ebay that are not too expensive. I can replace the 1N001 diode with a 1N004 diode, right? Hi, I have laser that I need to build a driver for. Can you tell me how I can build similar driver as seen above ? The only thing you would have to change is the resistor, which sets the current. I need a circuit which provides 1.7V and 37mA output. Please suggest. Does it have to be constant current or constant voltage? What load will you connect and whats the supply voltage? Hi. I noticed in the photos of the driver circuit you have 5 resistors in a row between the pot and the regulator. Was this to make up a certain value or for some other reason. I needed a 5 Ohm resistor, but only had 1 Ohm resistors at hand, they are just in series. Ok, thankyou, I thought that may be the reason. but I went with the cheap “solution” anyways. although (so far) it works fine for me without one. I should write 5 “Ohm”, not 5Ohm, sorry for the confusion! Could I leave out the fixed resistor, and just use one pot instead? The fixed resistor is in there to make sure that the current does not get too high. If you turn the poti all the way down, its basically 0 Ohm, and the diode will get fried. Hi Michael, thanks for your share great project. However, may i ask you can i use this circuit to switching on/off laser diode around 10~20kHz ? Not as it is. I think there might be a way to modify the circuit, but I never tried. Hi, I want to power a laser diode that has typical operating voltage of 1.8v and current of 350ma. Does this circuit only operate at 1.25v? the voltage depends on the resistance of the load and will be around 1.8V for you, if the current is set to 350mA. since the voltage will be according to it. The 1.25V is the reference voltage of the LM317 IC. Thanks for the article. It looks very easy but I can not seem to make it work. I left out the fuse and the pot but I dont see how that would make it not work. I am not an electronics person but I can use a soldering iron. I have tried to make it like numerous times and each time when I test it with a multimeter it still shows almost 9 volts coming through. Im using 2x10ohm resisters. Testing just with multimeters might not give you good measuring. I use a dummy laser diode (which is 6 N4001 diodes and a 1 Ohm resistor all in series) to test the curcuit. It simulates the behavior of a blue laser diode pretty well. I just connect that instead of the laser diode, so I can see if it works (by measuring the output current) without putting the real laser diode at risk in case the driver doesn’t work properly. Im new to all this stuff so could you tell me the components for testing a red laser driver circuit? I have a 400mW, 2.35v, 205mA red laser diode Im making the driver board for. Can you go into more details of how to use the testing circuit please. Sorry for so basic questions, I just have never made stuff like this. To do some basic testing for a red diode, I’d use 4 N4001 (~0.7V*4=2.8V) and a 1 Ohm resistor. I would solder them together (all in series) on a small piece of pcb and connect it (instead of the real laser diode) to the driver curcuit. Then I measure the current through the dummy laser diode, which should be pretty much 1.25V/5Ohm=250mA, with 2x10Ohm in parallel (I assume), which by the way is too much for your diode. You could even short curcuit the output to the laser diode, and only have 250mA (or whatever you set it to) flowing from the driver. Thanks again for taking the time to help me. 1. Should the line of diodes and resister be connected to the negative or positive out put from the driver? 2. Everything I could find said 2 x 10 ohm resisters gave the driver 150mA. Is that right? Opps. Ment to type 250mA not 150mA. 2. How are the two 10 Ohm resistors connected? in series they would give 20 Ohm, resulting in 62.5mA. Besides that, you might want to get a bit familiar with electronics before working on lasers. Not only are they really dangerous if handled improperly (giving it practically no space for experimenting), but also laser diodes break easily if anything is done wrong (including overcurrent, overvoltage (even small peaks), minimal reverse voltage, and so on) So having a good understanding of how each component of the curcuit works and behaves makes it much easier, cheaper, more fun and safer. I’m not saying that you can’t do it, but that it’s most likely better to first get some experience with not so dangerous stuff where you can just try and see what works and what doesn’t work, without putting that much at risk. Kindly tell me. If this circuit would work with IC-7805 instead of LM317. Reply Asap. There’s one problem: since the current flows via the potentiometer, if the potentiometer is not designed for over 1.5W, it will overheat and burn out. you will have a heating power of ~156mW. The potentiometer would then have to be capable of dissipating 1.56W in total. It’s usually better to use the maximum current of a potentiometer than the power to find the right parts. Really clean and easy to understand shematics.